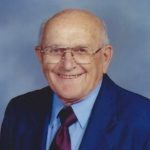 David Thomas Michael, age 92 of Hinckley, IL passed away at his home, surrounded by his loving family on Friday, February 8, 2019. He was born on January 20, 1927 in Big Rock, IL the son of George M. and Ida (Steinhof) Michael. David was united in marriage on May 6, 1950 in Hinckley, IL to the former Miss Betty Marie Morgan and they spent the next 50 years happily together until her passing on December 15, 2000. Mr. Michael served his country in the United States Army during 1946. David was a member, for many years, of the Hinckley First United Methodist Church. Mr. Michael was a member of Electrician Local #461 and was formerly employed by May Electric, Berg Electric and Cipher LTD. David was also a member of the Masons of Illinois. He enjoyed fishing and bowling with his family and many friends. David was a loving husband, father, grandfather, brother and uncle who will be deeply missed by his family and many friends. David is survived by his son, Darrell and his wife, Vilma (Viland) Michael of Hinckley IL; his granddaughter, Jillian and her husband, Ryan Yaggie of Aurora, IL; also his many nieces and nephews. He was preceded in death by his parents; his wife, Betty Michael; his siblings, Jack, Curtis, Spencer, and Randall Michael, Myrl Riis, Avis Thompson and Shirley Langdon. A Funeral Service will be held at 11:00 AM on Saturday, February 16, 2019 at the Hinckley First United Methodist Church, 801 North Sycamore Street, Hinckley, IL with Reverend Sejoon Jang, officiating. Interment will follow in the Greenwood Cemetery in Hinckley, IL. Friends may visit from 9:00 AM until the Hour of Service on Saturday, February 16, 2019 at the Church in Hinckley, IL. In lieu of flowers memorials may be directed to the Hinckley First United Methodist Church. Arrangements by Nelson Funeral Homes & Crematory, www.NelsonFuneralHomes.com or (815) 286-3247.